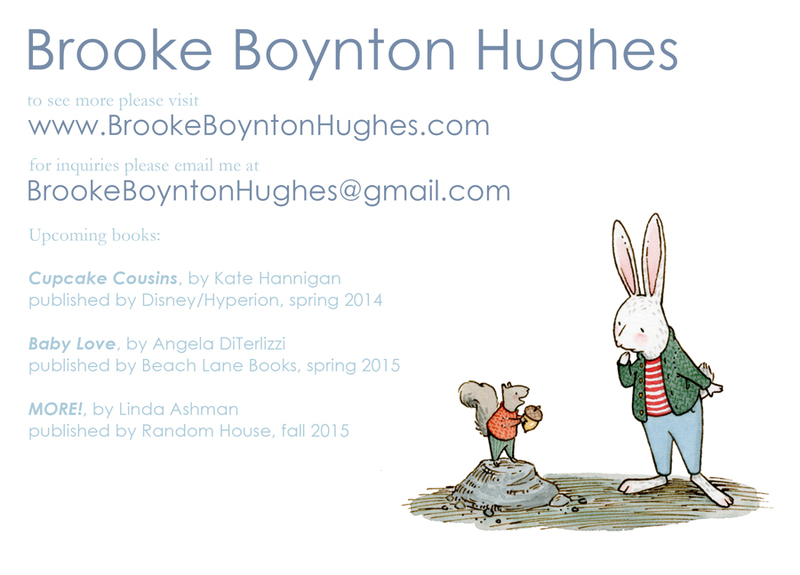 I knew I had to get Brooke Boynton Hughes to share her postcard tips after I saw her work on the Official SCBWI Conference blog. Brooke’s portfolio was selected as a runner up at the SCWBI Winter 2014 Conference in February. A jury of art directors, editors, and agents from children’s publishing chose from over 200 entries. Can’t wait to see this postcard! Brooke Boynton Hughes grew up in Loveland, Colorado where she spent her childhood days drawing cats, mermaids, and tree houses. In 2001 she earned a BFA in Printmaking from Colorado State University. After a brief move to Austin, TX, Brooke headed to New York City where she attended the New York Academy of Art and earned at MFA in Figurative Art. Now she lives in Fort Collins, Colorado and illustrates books for kids. When she’s not drawing, Brooke can be found watching movies, hiking, or learning to play the ukulele. Upcoming books include CUPCAKE COUSINS by Kate Hannigan, published by Disney/Hyperion, BABY LOVE by Angela DiTerlizzi, published by Beach Lane Books, and MORE! by Linda Ashman, published by Random House. Postcard front. I’ve got to know where that bunny is headed. Is there something up in the trees?! *Making the most of the back of the card! Since Brooke hands out her postcards at conferences, she can use the entire space on the back. Great promotional piece that demonstrates the versatility of postcards. It’s been years since I’ve actually mailed out postcards. I use postcards when I attend conferences, which is usually 2 or 3 times per year. * But, I’ve heard that sending out postcards every three months is a good idea. *Good alternative use of the postcard. *Good point: target and research! When I was doing regular mailings I relied heavily on CHILDREN’S WRITERS AND ILLUSTRATORS MARKET to figure out who was publishing what. If the description of a publisher in the Market book sounded promising, I would do further research of that publisher to decide if my work might be a good fit for them. I also looked at the picture books that I liked to see who published them. * Attending SCBWI conferences has been a really good way to learn about the preferences of specific art directors, agents, and editors. 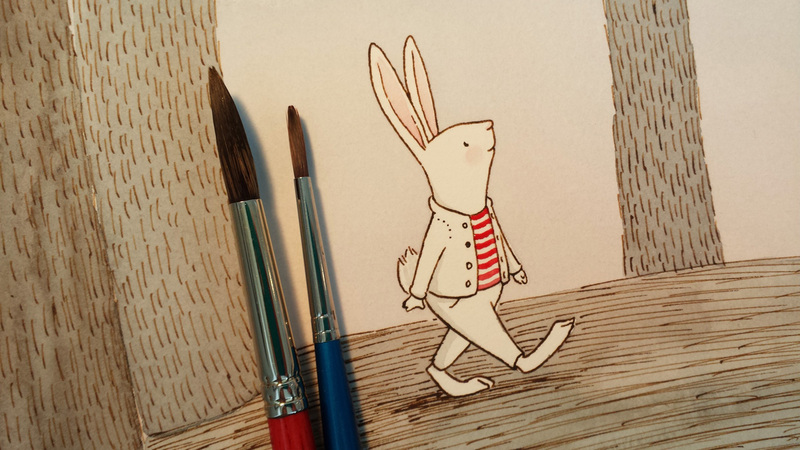 For me, sending out postcards in small batches felt more manageable. I’ve used both spreadsheets and hand written lists to keep track of what I’ve sent to whom. *Excellent way to research potential clients! I use Photoshop to design my postcards and I spend a lot of time experimenting with different fonts. I think as an illustrator it’s important to show a strong sense of design in your postcards. The text should be clear and easy to read and the words and images should work together as a whole. When I’m setting up a file for a postcard I make sure that it adheres to the specifications of the printing service I’m using and that I’m taking into consideration extra room for bleed and trim size. I use OvernightPrints.com. For the most part I’ve had really good luck with them, although I do recommend getting a printed color proof if you have time. OvernightPrints does rounded corners, which I really like. Thanks so much for sharing these great tips, Brooke. 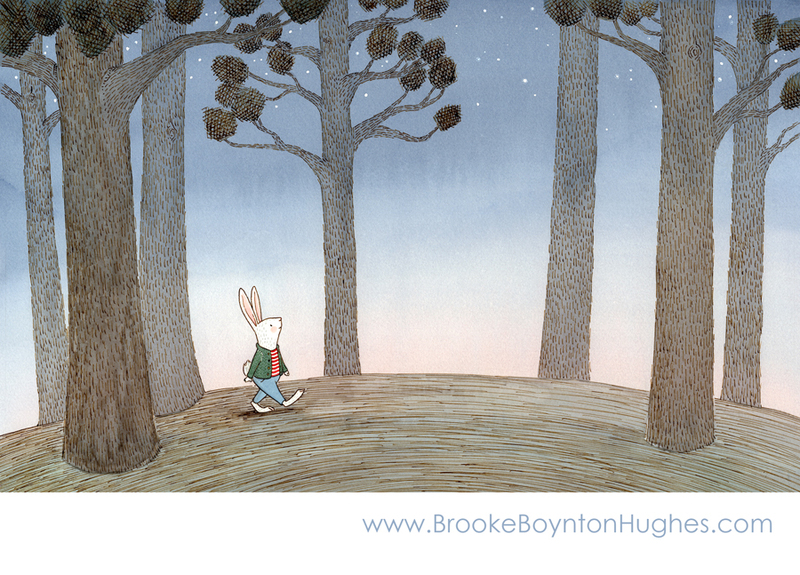 Brooke’s work always makes me feel warm and fuzzy inside! Can’t wait to see what magic she and Linda Ashman will create together with MORE! I love Brooke’s work. SO adorable! She has schooled us on postcards today. I saved all this information in a folder. Thank you to Brooke and Sub It Club! You’re welcome, Robyn. Clever you, making a folder! Great idea. Good thought on taking an image, or building on one from your portfolio. Thanks, Brooke and Dana. Really great primer on designing postcards. The little rabbit is so cute!